well, as of saturday night there's another red letter event to add to the list, as shortly after talking to my dad while on a driving tour of the association and surrounding country, scott took me to a remote location on the ranch, through a place known as eagles gap to a drainage full of springs and aspen trees, and asked me if i would marry him. he said he took me there because it's a place we both enjoy - out in the open, on the ranch, in the midst of sagebrush and aspens. and he was right. from there we drove to the top of the 'mountain' at the north end of the association, and watched two thunderstorms move through to the north and the south, and the sun set between them, the pinks and oranges showing through the distant sheets of rain down below. it was gorgeous. you realize this country out here is big, and then you go up to a place like that and realize it's immense. so now there's lots of planning to be done on that front, but not until i survive the next two weeks at the paper, as we've got to special feature editions, and our annual fall cattlemen's special edition, all of which has to be done before i leave for pendleton, ore. on sept. 12. i'm a little scared of the next two weeks, but hopefully it will come together more easily than i'm afraid. and that's other news - my parents did make it out to visit, arriving late friday night. they were in casper until saturday afternoon, when they headed over to lander to visit my sister, and i expect them back in town around 4 today, before they leave to return to iowa tomorrow morning. last night i cooked again, after cleaning out the fridge and rearranging the shelves to make more efficient use of the space. my new resolve is to use all my purchased fresh ingredients before they go bad, so that meant i needed to cook two recipes last night, one of which was my standby favorite, snow pea stir fry. it used the fresh snow peas and mushrooms. this is all the ingredients you need to make a delicious side dish. here it is all finished, toasted almonds get the snow peas and mushrooms added to them, then the cornstarch/soy sauce/chicken bouillon sauce, then just let it simmer a few minutes until it thickens a little. since the snow peas were an old favorite, the other recipe i made was a new experiment. here's the cooked brown rice and a pound of rough chopped tomatoes, ready for the dressing. the dressing was simple - rice vinegar, olive oil and some pepper. then you add chopped fresh basil - i had purchased some, and was determined it would not go to waste. my basil plants in my herb garden are done for the summer. when this was all finished and i tasted some i wasn't so sure about it, but scott loved it. if you like vinaigrettes, this one's for you. it took me a little while to warm up to it, but i liked it, and i think it'll be better after the flavors have had time to marry in the fridge. in this one i also added in green onion, since i had some of that in my vegetable drawer to use. here's the link to the food network recipe: brown rice with tomatoes and basil. 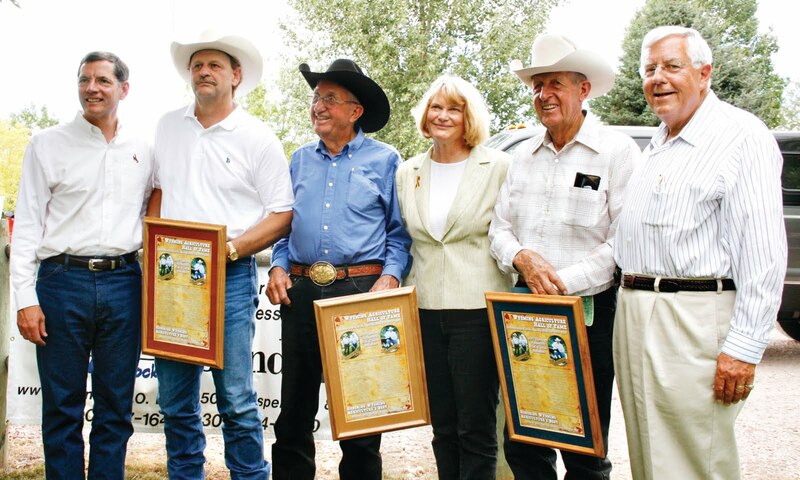 in the midst of everything else going on, i barely mentioned that last week was state fair week here in wyoming. 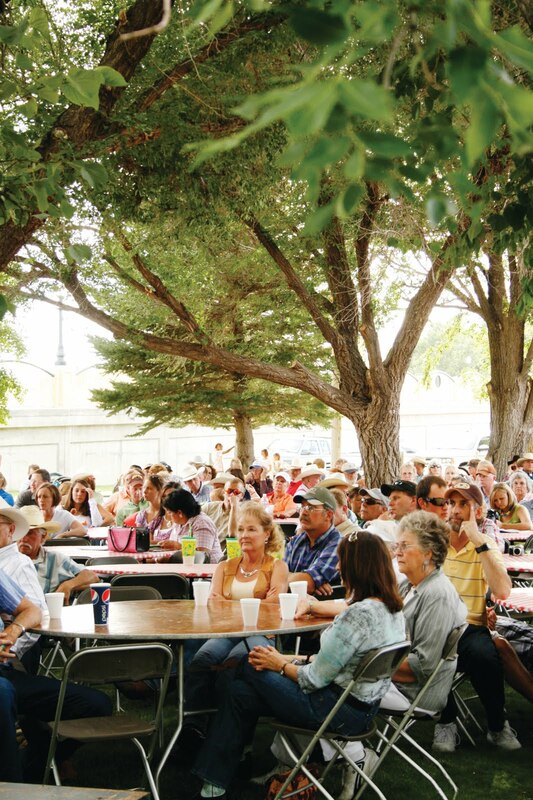 the state fairgrounds are in douglas, and wednesday is the big day for the roundup, as we co-host a cattlemen's conference all afternoon and then a picnic for our wyoming agriculture hall of fame that evening. the conference features four or five speakers on a variety of topics related to the industry. this year we had a lawyer working with the antitrust/meatpackers issue, an extension agent talking about profitability, or how to make the most money, in a beef operation and jim magagna, who works with the stockgrowers, but was there independently to talk about the recent deal struck with an oil company, el paso, about the ruby pipeline, which begins in western wyoming, and a separate deal struck with a couple enviro groups. 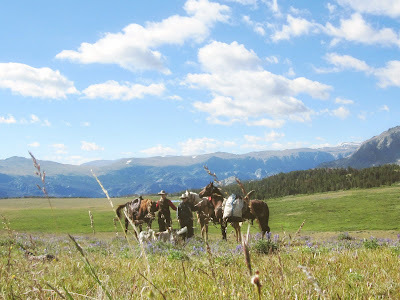 the problem with the deal with the enviros is that they came out and stated publicly they were going to use the money to end public lands grazing. as you can imagine, the uproar ensued. the ever-intelligent u.s. representative cynthia lummis, who had just been reelected by wyoming republicans in the primary the day before, was there to update the group on d.c. and what a mess congress is, and then we had the director of the wyoming oil and gas conservation commission speak on a new oil play taking shape in southeast wyoming, which is unusual because there's been barely any mineral development there before. 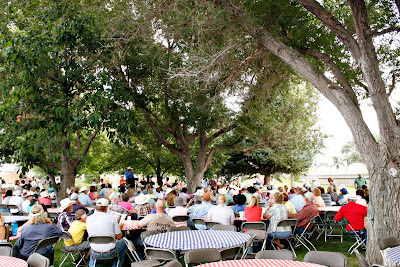 then we headed over to a park just north of the fairgrounds for our picnic, where scott helped set up all the tables and chairs before our program, which included two brothers inducted into the ag hall of fame, don and peto meike of kaycee, and grant stumbough of wheatland, who's the rc&d coordinator and has really helped the landowners in that area organize and group themselves to obtain stronger contracts from the wind development companies. 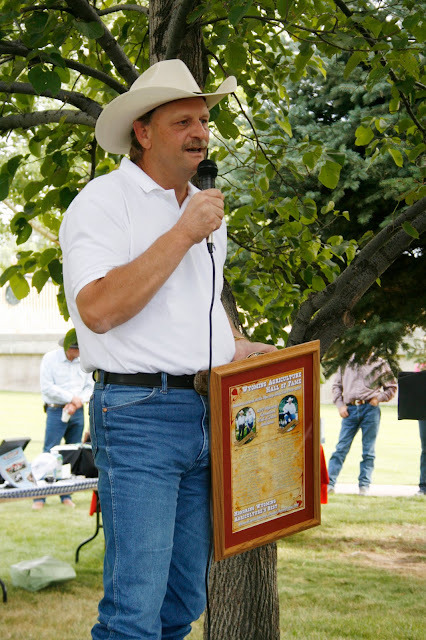 cynthia lummis also presented the wyoming ag in the classroom educator of the year award to kathy tatman of lingle. i can't remember exactly how many years the roundup has hosted the picnic, but it's never rained. come close a couple times, and dennis was a little nervous this year, watching a rain cloud go south of douglas. it was another beautiful evening, and it was hot when we got there to set up the tables and chairs, but it cooled down and there was a breeze, and it was gorgeous later that night for the locash cowboys/joe diffie concert that scott and i went to with his mom, sister and nephews. peto and don are two of the nicest gentlemen you could ever meet. and grant stumbough is very bright, and easy to work with, and is always available to answer questions. i have a feeling all the landowners in his area agree. and here they are, in live and living color, the locash cowboys, who dress so over the top that i couldn't bear to put their photo in the state fair edition. however, they did win me over a little, as they do sound really good. maybe i'll give them another chance or two, since their first single, released last spring, didn't help them out any, either. and the classic 90s country artist joe diffie took his turn singing to us. scott and i danced a little to some of his stuff, and i danced with scott's nephew dallas, but i tell you what, country swing dancing in a dirt arena is very tough. one fast song with dallas was enough for me! and then, walking out of the fairgrounds, the gates were locked and climbing over the chainlink fence scott proceeded to tear the entire nail off his thumb, so that spurred a trip to his mother's to doctor it before we headed back to casper. so even though the quick kale with bacon and onions recipe, from the seven best foods for women series, was a little sketchy, the next one in line looked very promising. not because it's salmon, but because it had a bourbon glaze. much to scott's delight, this recipe required the purchase of a fifth of bourbon - now gone after a weekend at the ranch. i decided to go for the good stuff and got knob creek, and you should have seen his look when he asked, 'you're not going to use that in the salmon, are you?' like it would be a shame to waste any of it on something so lowly as a glaze. yes, i did use a mere quarter-cup in the glaze, which also featured brown sugar and orange juice, and it was a hit! scott lit the coals on the grill and i thawed and marinated the salmon, which his mom and sister brought back from their recent trip to oregon. we put a layer of tin foil on the grill, since the salmon tends to stick, and pulled up the edges so we could pour marinade over the fish and hold it in the foil. it cooked down to a nice syrup consistency, and was oh-so-good. along with the salmon we also enjoyed grill-roasted mushrooms with butter and garlic salt. sure, we may have negated any health benefits of the salmon with the butter, but everyone needs butter in their life. no matter how many we pile in the foil at the outset, i think we both always wish we'd fixed more. they get scooped up pretty fast. so this was the meal that evening, with some added garlic bread also toasted on the grill. there were some salmon pieces leftover, and they were tasty for lunches throughout the week. here's what cooking light has to say about the benefits of salmon: While the omega 3 fats in salmon do everyone a lot of good, women net a few unique benefits. Pregnant? Studies find the oils in fatty fish like salmon can help you beat the post-partum blues, particularly if you ratchet up intake during the third trimester. Building blocks for the brain and nervous system, omega 3 fats are also critical for the developing fetus. In your forties and beyond? Keep in mind that heart disease is still the number one killer of women. And once estrogen levels begin to plummet, eating fatty fish can help keep the ticker healthy. Cooking Light recommends two servings (about 4 ounces) of salmon, or other fatty fish, per week. here's the link to the recipe: grilled orange and bourbon salmon. this last week i finally got back to the 'seven best foods for women' series i've been making my way through. so far, i've cooked with tomatoes and flaxseed. next on the list was kale, another ingredient with which i've never cooked before. here's what cooking light has to say about kale: An under-appreciated leafy green, kale is chock-full of a lot of good things for health in general, and some for women in particular. Antioxidants like lutein and zeazanthin protect the eye. Add to that a day's worth of vitamin C and small amounts of calcium. But tag its womanly superstar status to vitamin K, a potent bone builder. Researchers find that women who eat diets rich in vitamin K are at lower risk of hip fracture. Seems the body requires vitamin K to activate bone proteins needed to ward off osteoporosis, the crippling bone disease that strikes women four times more often than men. According to the website, at 36 calories per cup cooked, the sky's the limit. the recipe that went with it was 'quick kale with bacon and onions.' it's got bacon, so it's got to be at least consumable, right? i wasn't too suspicious, as i like cooked spinach. but i was, just a little. i started with two big bunches of kale, as the recipe called for 10 cups chopped, and i think i had more than that, but, like spinach, it really wilts and cooks down when put over heat, so two bunches wasn't too much. after browning the onions you add the kale in two batches, the second time letting it simmer a while to tenderize the leafy green. while it was simmering i fried and chopped the bacon, throwing in a good amount of extra. the entire recipe only called for two strips, and that's just not enough in my kitchen. it ended up being pretty good, but, to tell you the truth, i probably won't seek out kale to cook for this recipe again. i might give a different recipe a try, though. and, with the salt i added to the greens themselves, plus the bacon, it ended up over-salted. if i was to make it again, i'd leave out the straight salt, add in the extra bacon and it'd probably be ok. it didn't help that i used store-bought bacon, which tends to be way more salty than bacon from the local locker. here's the link to the recipe: quick kale with bacon and onions. sorry, it's been a while again since i've had time to post anything. the last few days have been full, with many different activities last weekend. friday night included a trip to the beacon with friends jake, heather and dylan. (i don't know if that's the right variation of spelling on his name.) from the beacon dylan thought it would be great to go to casper's karaoke joint, and that was an experience. the consensus was it was like walking into a circus... i knew there was a reason i'd never gone in there! 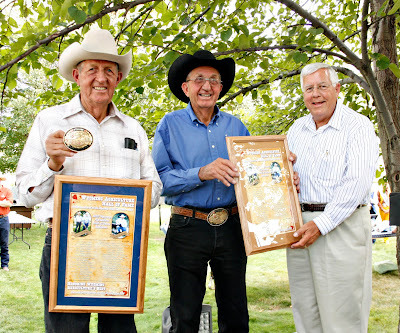 saturday morning i had to head to douglas for the last time of the 2010 wyoming state fair, to cover the centennial farms and ranches recognition ceremony. if i'd remembered to bring that memory card to the office i'd show you some of the families, but, it's at the house. saturday afternoon i had to take a little nap after cleaning the office, as i'm getting too old to close the bars down, i guess. then i headed to jake's to pick up scott's trailer, which i needed to swap out for my own up at the association, and april, who i used on sunday to gather and trail cows. that leads to the photo posted above, in the wee hours of sunday morning, when jamie knocked on my door and woke me up about 4 a.m. when it was still completely dark. you know its bad when you get to sleep later on weekdays before going to work than on the weekends! although it was very early, i'd slept well and was ready to get up, and it is kind of pretty watching the whole sunrise, and it was warm out, which was nice then, but bad later because the day quickly heated up. becky made us all breakfast - i counted 13 horses in the barn later that day that'd been ridden - which was bacon, pancakes, eggs and plenty of black coffee, and we headed out to saddle and load horses, arriving at the pasture to gather just before 6.
once at the pasture, we all unload, bridle, tighten girths, and do all that good last-minute stuff before heading out our separate directions to find all the pairs and gather the cattle. we start riding in one bunch, and are gradually split off with different orders by bob, who runs the whole operation. i ended up heading around a corner and up this meadow with a small bunch, who moved very easily. jamie was with me, before heading off to the north to gather up some more out of a big, boggy draw. there's jamie off to my right, headed up on her circle. while the country was pretty green most of the summer, it's really starting to burn up, and it's dusty, and we could use a few good rain clouds. it's been a while. 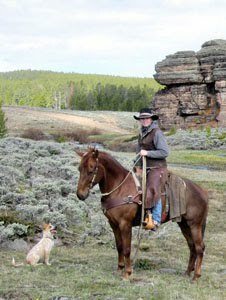 i took lucy to work with me for the first time, and up to this point she'd dutifully trailed behind my horse, as i'd taught her the weekend before on our pack trip. when we got up close to these pairs she decided to try her hand at herding them, and she thought it was great fun. in this photo she'd just got after that one pair running away - the cow with her tail up and the calf kicking. she was smart about it, and didn't mess anything up the whole day, and would get after calves, chasing them back into the bunch, but coming right back out and not stirring things up. and she already knows to dodge kicking hooves, esp from the cows. "look, i've got them on the run!" you can see the lead trailing over the hill across the meadow, headed over to the gate. they were ready to move on to a new pasture. this photo was taken when the whole bunch was gathered and headed to the gate, trailed by the riders. this was also after april and i found a 'soaphole,' or an isolated, bottomless bog only about five feet across. it looked no different than all the dry, dusty tan dirt around it, and we walked right in. i think april pulled something getting out. it sure woke us up. just over the next hill after clambering out we came upon another soaphole with a dead cow in it. thankfully we didn't have to just give up and die in ours! the morning quickly warmed up, and there was a water spot in a marshy area about halfway to the new pasture, which i was glad of for lucy's sake. this is her in the reservoir we took the cows to. it's low, and late in the season, so pretty dirty, but lucy was grateful it was wet. the other dogs were swimming, but lucy's still uneasy when her feet can't touch the bottom, and she turned around and kept close to shore. i know it's been a while since i've posted. hey, we made it out from the pack trip mostly unharmed! just a few sore puppy paws and horse shoulders, but all in all it went right along just fine. this was the second morning of our trip, on top of the pass - i forget its name - before riding south and dropping down into that drainage behind us - the dinwoody, named after a large glacier that feeds the wonderfully blue-green creek that meanders through the valley. i took jazz with me on this trip, as it was very rocky and technical, and i try to spare april from such things anymore, as she is getting advanced in age at 17 years and has never been very nimble or level-headed, anyway. jazz did very well, patiently navigating the rocks and paying attention to where her feet were and not panicking when she slipped. she did get quite sore by monday morning, and i was glad we had a short three-mile ride out. now she's recuperating in the pasture, and it will be mid-september before i use her again, as my weekends are busy with other activities until then. this was morning two, after we'd ridden in, almost to the head of the dinwoody drainage. that's gannet peak in the background, to the right, with the snow on top. 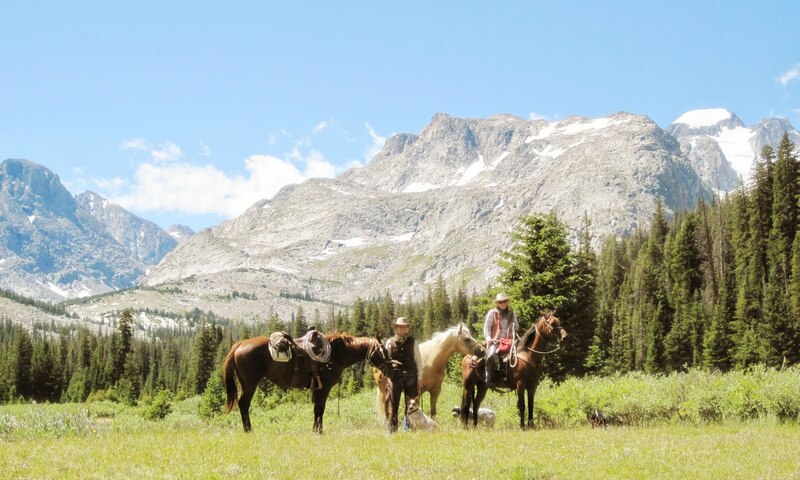 it's the highest point in wyoming, beating out the grand teton by a mere 80 feet. it was gorgeous up there! we tried to ride in to see the dinwoody glacier, but beyond a certain point the trail isn't maintained for stock, and it was too washed out and too many overhanging branches. worth the ride up there, nonetheless. yesterday was spent at state fair, and the fair concert last night, which was locash cowboys and joe diffie, and today will be dedicated to finishing up all that coverage, so maybe i will post more photos tonight? tomorrow morning? i will try. 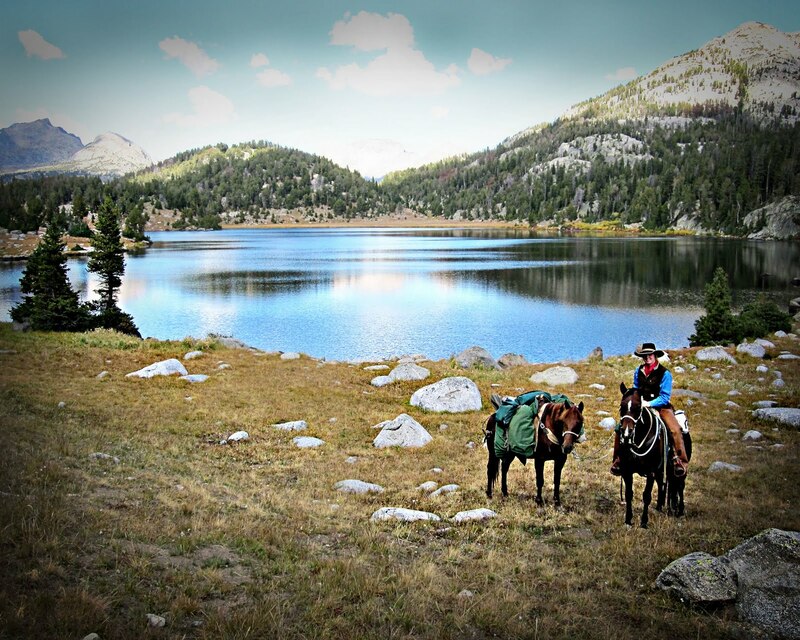 wind river pack trip, take two! the above photo was taken on last september's pack trip on the south end of the winds. pretty quick here i'm headed west with the truck, trailer, horse and dog to join melissa in lander, and head to dubois for our second annual pack trip in the winds. we're leaving from the torrey valley trailhead south of dubois, a beautiful location in itself, and heading up into the wilderness, making a big loop and camping four nights. only one of my girls is coming on this trip, as my sister now has two horses and will pack her little bay quarter/arab cross. we'll pass by many peaks and glaciers, and my sister's been on the trail before and she says it's worth the ride. see you all sometime monday! last week we had several afternoon storms go through. one of them was pretty big and black and windy, but the nice part was when the clouds moved off and the sun came out it was 20 or so degrees cooler. so that was the evening i was brave enough to turn on my oven, and the three things i made that evening all took their turn. the first of them was the 'beer bread in a bottle' that coworker curt gave me at my housewarming. as we had plenty of bud light leftover from that same party - turns out coors light was the preferred by just about everyone - i used a can of that. you simply dump the cry mix out of the bottle, pour in a can of beer, mix well, put in a greased bread pan and pop in the oven. and boy, was it ever good! very light and soft and moist, great texture, and it didn't last long around the house. and no yeast to mess with! i'm a believer in this product now. in my fridge i also had a package of ground beef languishing, in need of a recipe to use it up. something besides hamburgers. i went to an old stand-by from a beef checkoff recipe booklet, 'greek meatball subs with cucumber-yogurt sauce.' i've made the whole thing before, and they are really good with the sauce, but i lacked the cucumbers and tomatoes for the sauce, so i just made the meatballs. they have yogurt mixed in with the ground beef, and greek seasoning, and they're really quite good. not at all dry like meatballs can get. the bread baked up wonderfully. i was a little skeptical as to how lumpy it got. the meatballs smelled wonderful. to make things easier on myself, i should line the baking sheet with foil. but, baking the meatballs on the rack keeps them up out of the grease, but my ground beef from the grazing association is pretty lean. yum, vegetables! they were delish, esp with the little bit of leftover grated parmesan cheese i also had sitting in the fridge. so i used up a lot of leftovers from my fridge that evening, and ended up with a tasty meal and leftovers for the next week's lunches to boot. and my lu. curly tail and all. this is a short week for me, as i have to run to alcova for an interview in a few minutes, then tomorrow morning out for coworker paula's daughter's senior pictures - heather's taking them, and she's using one of my horses for a few of them, then shoes all the way around for jazz for our pack trip. wednesday i'm in the office to finish up writing and organizing the paper, then thursday bright and early i leave to meet my sister in lander for a pack trip through the next monday. i'm tired already! but the pack trip will be relaxing, through gorgeous country in the northern wind river mountains. lucy gets to come along, and hopefully it's not too cold! it was quite nippy last year, but we went in september, but the high temps in dubois during that time are only supposed to be in the 70s, so it'll be even colder in the high country. heather was the official photographer for pathfinder, so hopefully i will be able to share some photos of the events of the day. for now, i have to go interview some people who grow famous sweet corn at alcova. i tell you what, in my opinion we don't have too many staff here at the roundup. this week designer tracy took off, and i laid out the paper, and writing the editorial, organizing all the content and then laying it all out is sure a big task. but, it's done and sent to the printer and, as far as i know at this point, has no glaring mistakes! 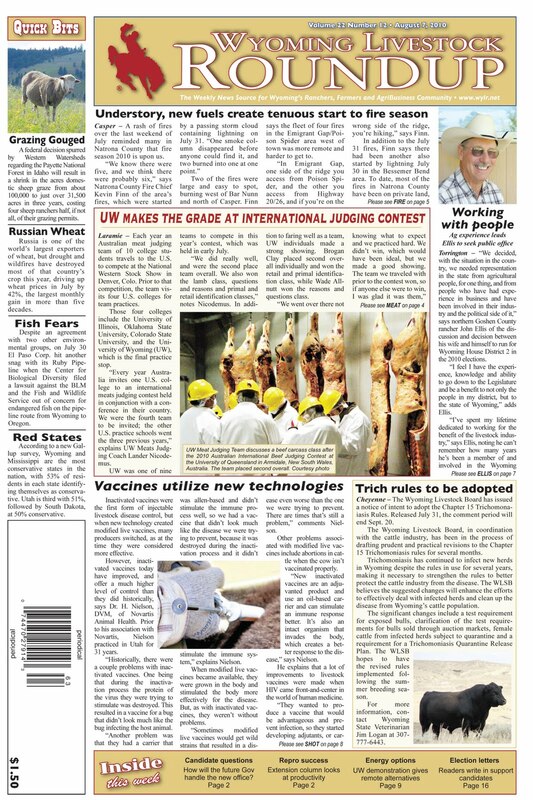 our state fair edition also inserted this week. every year about this time my mind drifts to reviewing all that's happened since the day aug. 9, 2006.
all my belongings were packed in my little yellow mercedes and my parents' airstream camper. 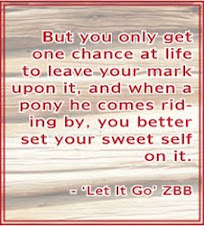 my bay mare was in the trailer and we were all headed west to wyoming for a moving trip/family camping vacation. i also had a farm kitten in my car, which i'd nabbed from under the grainary right before leaving. that's the present-day link cat. 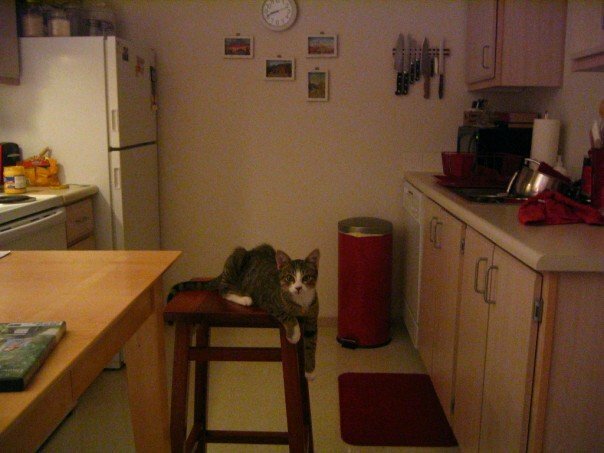 here is the little link, in 2006, shortly after moving into my apt. those were the days when i had all the time in the world! i cooked a lot, i learned to knit, and then crochet, i braided a large living room rag rug, sewed link a coat complete with fur trim.... i did enjoy that time alone, and i'm glad i did, cause i sure don't have time to do those things now! i'm lucky if i have a few evenings a week of down time. my weekends are full, and usually several weeknights. but that's ok, i love going places and meeting people and visiting those whom i've already met. and, no matter how much we determine that we are going to keep a weekend free, we can't help it and end up going somewhere. so 2006 was four years ago, when i moved out. in 2007 i was still with the ex-him, and still didn't have a whole lot going on, and i was still hell-bent that i was moving back to iowa after i did my time. i told myself i'd stay for two years. 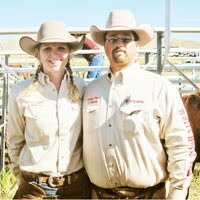 then, in 2008, about this time of year, i attended billy keith's branding with good friend emily, whom i met when she came to wyoming on internship from missouri, and sister melissa, who came over from the west side of the state. 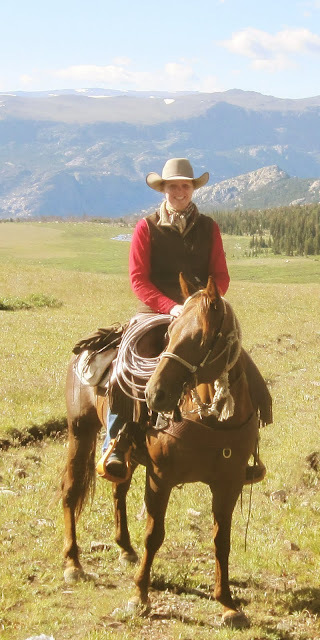 emily and i stayed out there the night before, after helping the keiths gather their cows into the 'trap,' or smaller pasture right next to the corrals. after the branding new friend griff invited us to go to deer creek days in glenrock, where his cousin (scott!) was competing in the ranch rodeo. that evening i also met friend dejoe. that evening i had pendleton for the first time. the rest, i finally figured out recently, came about because the west had won my heart, and the ex-him had lost it forever. i just didn't know it yet. so then the next summer in 2009 scott attended billy keith's branding, and i had recently seen him at the powder river sheepherder's fair, so we talked again, and that's when he asked to ride with me back into town, and he got my phone number in a roundabout way because he was too scared to ask me for it straight-up. :-) in the weeks to follow we went to frontier days, pathfinder days, i helped moved cows at the association, and the rest really is history. he loves to do all the things i love to do, and i didn't intend to start dating him, but his offers were so tempting and i could never say no. he gives me the opportunity to do all the things i've always wanted to do. that leads to this year, 2010, where billy keith did not have a branding, so good thing scott took the opportunity last year! looking through my photo folders on my computer from the last year, this is what the 'events' folder reads: buffalo creek camping, camp branding, christmas, elk hunting, holly's visit, horse branding, housewarming, ice fishing, july 4th, meeteetse ranch rodeo, memorial day moving cows, pathfinder branding, paula and michael's wedding, pocatello rodeo, roundup office moving, stone branding, trav's branding, roundup picnic, truck lights and tyrone day. and those are just the things in one category! i may be too busy to remember five of the ten things on my grocery list, or three out of three things i need to take to the office on a given morning, but really, i wouldn't have it any other way. being with the guy in the photo above makes me thoroughly happy, and i'm looking forward to the next 85674 weekends full of trips, travels and events, shared with him. 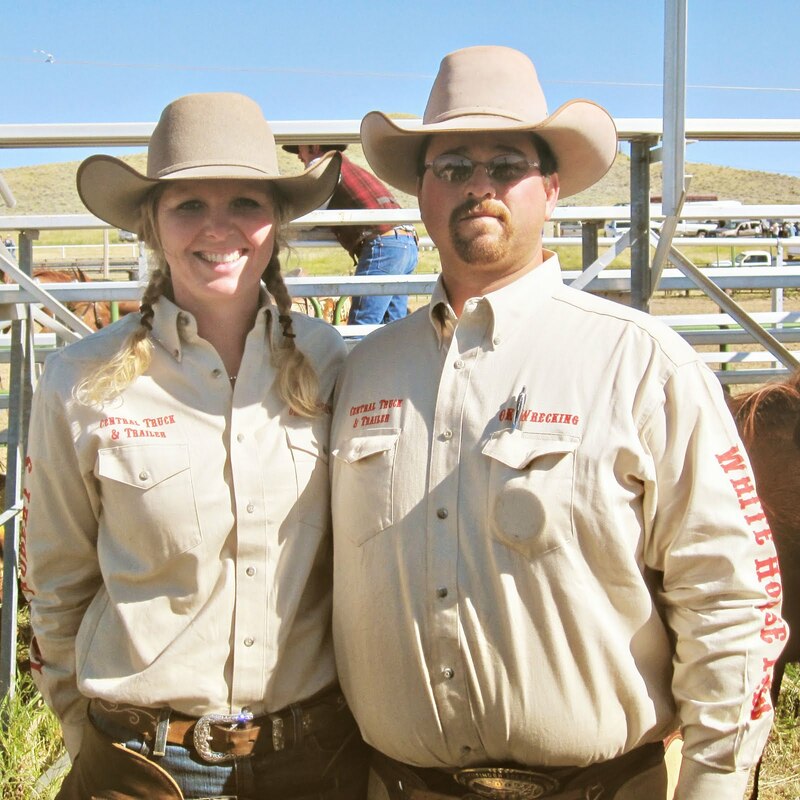 the next red-letter event that approaches is the pendleton roundup in mid-september! and more i'm probably forgetting.... or that haven't happened yet. for now, it's up to the ranch with a horse this evening, and pathfinder days tomorrow. good times!